Date Added: Sunday 06 March, 2016 by Josh E.
An absolutely impeccable piece. Truly, this is one of the nicest items of clothing I have ever owned. The detail and quality is top-notch, and was tailored excellently, it fits like a glove and is incredibly comfortable. The time it took to create the suit was well worth the wait, and arrived on my doorstep the day after it was shipped. I cannot wait to wear this as often as I can, the Tenth Doctor is without a doubt my favourite incarnation, and Magnoli Clothiers have definitely done his suit justice with their spot-on handy work! I will certainly be buying from Magnoli again in the near future! If you have any doubt about purchasing this item, do not hesitate - as long as you get your measurements right, you won't regret it. Wonderful suit!.. Date Added: Thursday 25 February, 2016 by Evert J. 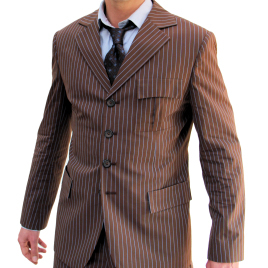 Date Added: Thursday 11 February, 2016 by Chris S.
After several years of cosplaying the Tenth Doctor, I finally saved up enough to purchase this amazing suit and goodness was it worth it! The tailoring of the suit is phenomenal, and it is by far the best fitting suit I've ever owned. The screen accuracy of this suit is nothing short of spot on, the colors are rich and the pinstripes are wonderfully crisp. The only fault I could find was a small batch of uncut threads under the breast pocket flap, but nothing a few quick scissor clips couldn't take care of. If you purchase this suit be prepared for the barrage of compliments you will receive when you wear it! I couldn't be happier with it. Thank you Magnoli for an amazing suit I go out of my way to make excuses to wear!.. Date Added: Wednesday 27 January, 2016 by The D.
I have been Cosplaying The 10th Doctor for longer than i can even remember and i have had my fair share of suits, all of which i have loved. So when i came across the Magnoli, i knew this would be the ultimate upgrade. Having bought many ties and numerous other Tenth Doctor items, i never doubted the quality of the suits and having many friends tell me how good they are, it made my eagerness grow more and more. So when i could finally get my hands on it, choosing Brown as it's my personal favorite. When i got it, i cannot comprehend the excitement, i felt like a little kid watching him on screen in the exact suit and now when i wear it. I swear it's the same one :D I would suggest this to any Tenth Doctor, it's a lot of money i know, but it's more than worth it 10/10.. Date Added: Thursday 24 December, 2015 by Thomas D.
Date Added: Thursday 10 December, 2015 by Max G.
Once again, Indy did a fantastic job. This suit is picture perfect to David Tennant's Doctor. The color and fit is as perfect and you will feel as if you are everyone's favorite time traveler. I was at a rather larger Halloween party this year and got so many compliments on the suit. Many people even asked for pictures with me! Thanks again Indy and Magnoli!..